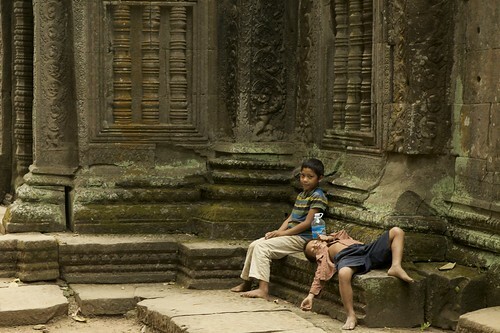 Throughout Siem Reap, pretty much wherever we went, kids of all ages approached us to sell us something – anything. Persistent as they were ubiquitous, the tourist economy of this area was most obvious watching them follow and harass visitors with offers of guide books, postcards, bottled water and god knows what else. My instincts as a New Yorker stopped me from even considering making a purchase from them. This apparent heartlessness was validated after seeing one lady swarmed upon after buying postcards from one child. Seemingly a dozen of them flew over demanding that she buy something from them too. No thanks. Interestingly, the one exception for all hawking was within the bounds of the temples of Angkor Wat. Outside, they badgered and encircled potential customers, trying everything from striking up conversations to offering compliments – I was even told by one that I look like Obama. Yet, as soon as you walked in the ruins, it all stopped. Some of the kids were inside, but they sat and rested or napped. I won’t read any reverence or respect into this and just assume it’s just not tolerated there. Regardless, it provided a much appreciated break for all of us. I have mixed feelings about child hawkers. On the one hand, it’s unfortunate they are doing what they do, they are in all likelihood orphans or runaways. They know their plight and hope better off souls can help them out. There’s a great movie about Saigon child hawkers on Netflix streaming, “The Owl and the Sparrow.” I urge you to check it out if you haven’t done so already. Maybe I’m looking at it the wrong way, but Siem Reap actually seemed to be doing pretty well. The kids didn’t seem particularly hard off, destitute or not cared for, they were just part of the tourist economy like the guys driving tuk tuks and the restaurant workers. There are hordes of tourists (us included) who were through spending money everyday in a place where $1 equals 4045 riels. Compared to say, driving through the Philippines, which we did later, Cambodia – or at least the area we were in looked positively flush.